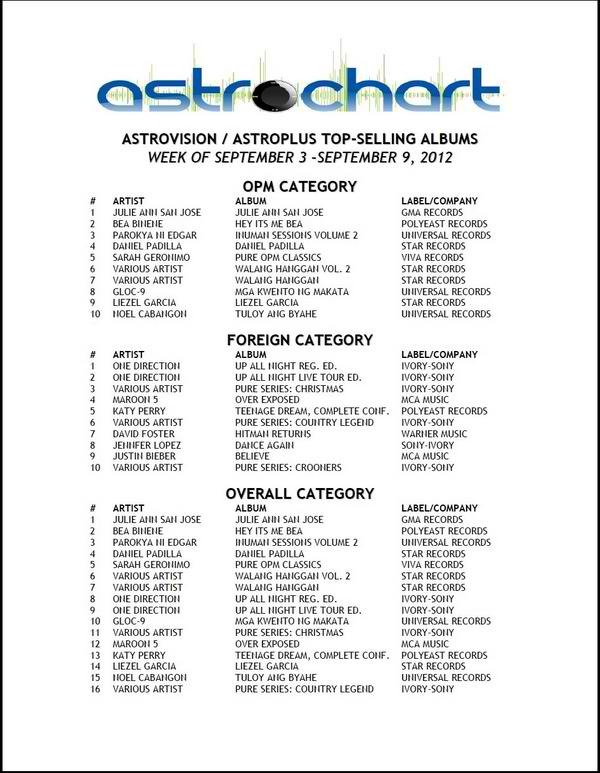 Liezel Garcia 's self-titled album debuted at #9 in the latest Astrovision / Astroplus OPM Chart (for the period September 3 to 9, 2012). But of course, the songs included in the album also contributed to why it's selling in music stores. I particularly love its carrier single "Ngayong Alam Ko Na", which is the official Philippine theme song of the Koreanovela 'Two Wives', currently airing on ABS-CBN. 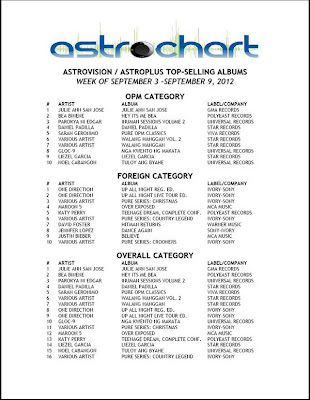 Liezel Garcia's album is the only new entry in the latest Astroplus OPM Charts. One (1) of the Top 10 albums is now on its 2nd week (Sarah Geronimo's "Pure OPM Classics"), two (2) are "re-entry" (Albums of Bea Binene and Noel Cabangon) and the rest have been on the charts for 5 weeks or more already. The longest-staying in the chart are "Walang Hanggan Vol. 1" and Daniel Padilla's debut album. Back on top of the chart is Julianne San Jose's also self-titled album. Jessica Sanchez guests on Eat Bulaga!